For many, the image of France as the height of gastronomy, wine, and artisanal craftsmanship is a given. Fabled restaurants such as La Tour d’Argent with waiting lines measured in months, the esteemed chateaux of Bordeaux commanding stratospheric prices, and the fiercely independent craftsman producing fromage in the methode traditionelle all lend credibility to this image. But Michael Steinberger paints another picture of France. One in which once famed restaurants are closing due to an in ability to make a profit, where wine consumption is down 50% since the 1960’s and where the livelihood of cheese producers is threatened by the bureaucracy of the very country they serve. Au Revoir To All That is a well researched and well told story of the supposed decline of all that France stands for in our minds. Michael Steinberger takes a culinary tour through France visiting with the heroes of the story; restaurant owners, artisanal producers, vintners as well as the villains; the Michelin Guide, The head of McDonalds France and the French people and bureaucrats themselves. Steinberger writes with a genuine love of France and it’s culture as can be seen in the kind portrayal of the people’s whose lives are going under due to an inability to make a profit and the strong emotion felt throughout the book. Despite all the evidence to the contrary the book ends on a positive note with Steinberger hopefully noting the new chefs coming through the ranks and the sense of perseverance and dedication shown by the people who make their livelihood through well crafted food and wine. 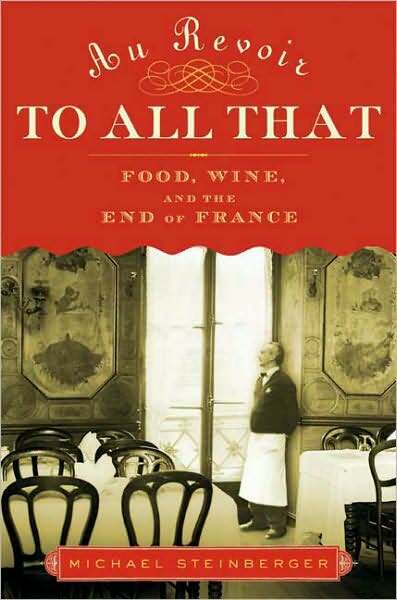 An entertaining and informative look at the food and wine culture of France sure to give you an appreciation for the fine arts of gastronomy and vinification.